PROTECT YOUR INVESTMENT! Cradle your iPhone 5 in your hand and look at it's sleek, flawless 4.0 inch screen. Gorgeous, isn't it? You don't want that beautiful screen marred by scratches, scuffs and cracks. 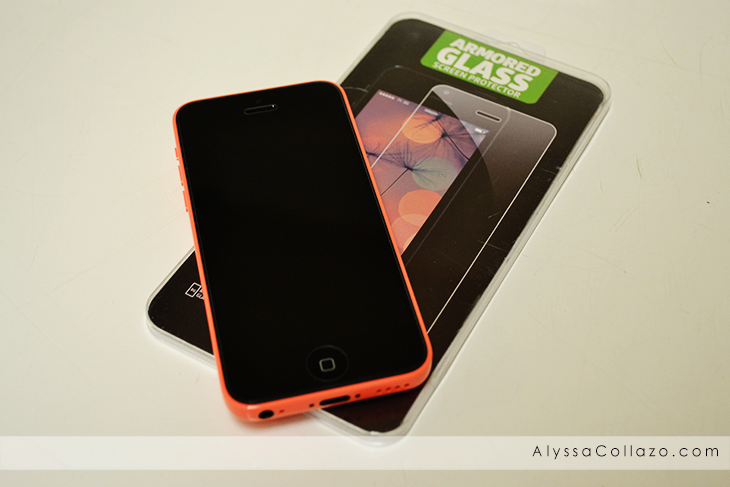 This Tempered Glass Screen Protector keeps your iPhone 5's screen looking as perfect as it did the day you unboxed it. INCREDIBLY STRONG, AMAZINGLY CLEAR! - The Tempered Glass Screen Protector uses an advanced triple-layer design to ensure 99.99% clarity and touchscreen accuracy. It feels like you're touching your actual iPhone 5's display. LESS SCRATCHES, SMUDGES OR FINGERPRINTS! - When you apply the Tempered Glass Screen Protector your iPhone 5's display will remain as bright and clear as a cloudless spring morning. That's because screen protector's state-of-the-art nanostructured coating literally prevents scratches, smudges and fingerprints! I purchased my iPhone 5C a few months ago and absolutely love it. The only downfall, it's incredibly hard to find a screen protector that actually fits. And then, iArrow offered me to review their iPhone 5 Tempered Glass Screen Protector. Surprisingly, it fits ALL models of the iPhone 5, 5/5S/5C…5C!! Finally, someone thought of us 5C owners! I love The tempered glass!! I don't think there is a better one out there to be perfectly honest. It feels like you are touching the actual screen. I am pretty clumsy when it comes to phones. I mean I'm a mom, so I'm always doing a million things and sometimes just forget my phone is in my lap or in my pocket. I drop it face down a lot. I feel so much safer now that this Screen Protector is on my phone. IArrow iPhone 5 Screen Protector is easy to apply and I highly recommend it. You don't want to have to purchase a new phone, or have one repaired. The prices of cell phones can be outrageous, so having this Screen Protector could extend the life of your phone. DISCLAIMER: All products received are complimentary for testing purposes from Tomoson.com. All opinions stated are my own and are not influenced by any affiliates. I always have little fingerprints all over the screens of my iPhone and iPad. This is a really great idea and I definitely need to get one. I have a similar protector on my new iPhone too, and it works really well. With the cost of these new phones, you really need the protection. The kids cell phone screens were scratched up within the first week. I wish I had gotten some of these but happy to know about them now. I don't have a screen protector on my phone. Then again, it's a Blackberry and luckily known to not break as easily as an iPhone. no fingerprints.. i need to readdress this on my phone. all i every am cleaning is fingerprints. What a great product I couldn't ever get these protectors on my iPhone properly, but I never tried this one! It looks great! Need one of these, I've just been to lazy to go out and get it. Might have to now! This screen protector sounds pretty awesome. I always make sure to get one when I get a new phone. I need to keep it safe! Protector screen is the first thing I bought for my iPhone. Such an important accessory! Wow! What a great product! I am looking into upgrading from the iPhone 5 to the iPhone 6+ soon - do they make protectors for the 6 line yet? :) I definitely want to protect my screen so it doesn't shatter! With a toddler at home that loves playing games on my phone, I want to be sure it is protected as well as it can be! It is always nice to keep extra screen protectors laying around. I will pick some of these up. You gotta have a screen protector! I've broken THREE iphones because I forgot to use one! Oops! I so agree with you, I have an iphone 5c for work and I have been struggling to find a screen cover for it. Glad to know this one worked and doing a good job of it. I totally agree! I am very cautious with my phone because my 1 year old tends to throw things across the room haha! Thanks for sharing! I have this bad tendency of dropping my phones. Luckily I keep them in the case, which takes most the hit. I have yet to crack an iPhone screen, although I've always thought about getting something like this just in case! My phone gets toddler handled a lot, and I'm fortunate that I have a good phone protector on it. The screen, on the other hand, is something that needs protection from the smudges. I always have a screen protector on my phone. My kids use them as well. Phones are so expensive now it is silly not to protect your investment. I always have a screen protector on my phone. I have always had an Invisisheild. They have such a good guarantee/warranty. They are expensive, but worth it. They have saved my husband quite a few times. I am in need of a new one as mine is started to peal up around the button. I want to look at other options since there are so many out there now. Scratches, scuffs and cracks on a phone drive me nuts…and I constantly drop phones, so whatever I have to do to protect mine…I try my best to do. I don't have an iPhone5, but I know someone who does. I will tell them about this screen protector. I'm so clumsy so I need protectors for any device I get. I have an Android phone, but my son has an iPhone so I will show him this screen protector. I have been looking for some nice screen protectors for me and my son ever since we cracked out phones. I will have to look into investing in one of these. I need to get this for my iPhone! I need one! Wow, this is great. I, too, have had a hard time finding a good screen protector. This is something to look into! I sadly don't have an iPhone. This sounds like a great screen protector though, I wish I had one for my phone. My wife has an Iphone 5. She is always looking for a great protector. This information is going her way. I totally need one of these! But I need to upgrade my phone first. Oops. I don't have a screen protector on my phone but it's not an iPhone. My husband does though. We live dangerously around here - no cases, no screen protectors. Something like this tempered glass one might be worth trying though, I was always endlessly frustrated by the plastic film ones that invariably bubbled up and really didn't protect against much.